For my modern interpretation of Romeo and Juliet I decided to make a book jacket. My book jacket shows two people who fell in love but can’t be together because the girl’s parents don’t agree she should date him because they think he will be a bad influence on her based on his background. The girl’s parents don’t want her to date that guy because he dropped out of school, and didn’t want to pursue to a good job. This isn’t a impediment for them wanting to be together. On the girl side I put the things she has achieved,like completing her education to have a good job and future. Her achievement are all good things that helped her throughout her life to better herself as a person. The heart in the middle represents their love and how they are slowly having to be apart due to her parents. The heart has a band aid because it shows that they still want to be together even with differences which in this case is class. Therefore the theme that best represents a modern day of Romeo and Juliet is love is blind to differences. This means that even though they both have many differences they were still capable to fall in love. 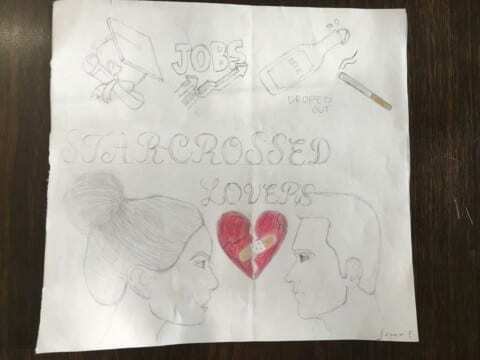 Star Crossed Lovers by Joana is licensed under a Creative Commons Attribution-ShareAlike 4.0 International License.